Twenty years ago, Norm Coombs and colleagues from Project EASI (Equal Access to Software and Information) established a free online e-journal that has informed, inspired, and captured the ever-evolving state of the assistive technology (AT) and information technology (IT) accessibility fields. This special issue of the Information Technology and Disabilities (ITD) Journal celebrates its impact over two decades. It features articles from a dozen pioneers in the field, most of whom have published articles in past issues of the ITD Journal. Authors share their stories about how assistive technology and accessible IT have evolved over the years and what new challenges and hopes they envision for the future. In the paragraphs below, the editors each share their journeys in this field and then introduce the authors and the stories they share in this 20th anniversary issue of the ITD Journal. My journey in the field of assistive technology began more than 20 years ago. In 1982, I hired an engineering student at Saint Martin’s College—where I taught mathematics, computer programming, and computer applications in education—to modify an Apple II computer with a switch box to lock the shift, control, and repeat keys. 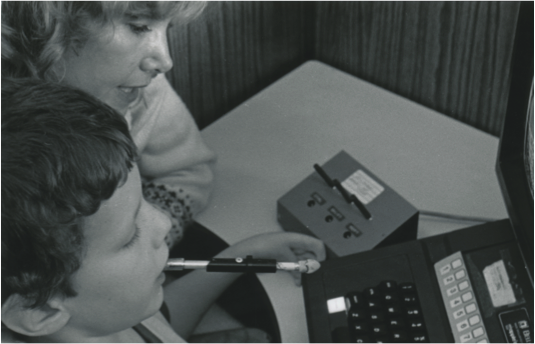 It needed to be designed in such a way that a 6-year-old boy, Rodney, could operate the switch box, and therefore all of the functions of the computer, with his mouth wand. Passing through a chain of education technology leaders at the time, I found Gregg Vanderheiden and his colleagues at the University of Wisconsin, who mailed me a hand-drawn picture showing how to build an external switch box. Included in this article is a picture of me with Rodney, who is operating the computer using his mouth wand, the computer keyboard, and the switch box. I want to tell you my name. My name is Rodney and I Am 6 years old…I am handicapped bebecause I can’t use my legs or my hands because I have little muscles and dbones. I go to Skyline Exceptional School…I get to learn to type with my special mouth wand. Someday I will get to use a computer because I am smart even tho handicapped. So, Rodney and I embarked on our own little journey, exploring how technology could enhance his performance in school and his life overall. Back then, we did not imagine that by today there would be thousands of commercially-available AT products, let alone the many features that benefit individuals with disabilities that are integrated into IT products. Word about Rodney spread, and St. Martins became a magnet for those exploring computer access issues for individuals with disabilities. I recruited any experts I could find to teach Saturday workshops on computer use by students with physical disabilities, visual impairments, and learning disabilities. Because of these experiences, when I was hired to lead the new Microcomputer Support Group (MSG) at the University of Washington (UW) in 1984, I immediately added making IT accessible to faculty, students, and staff with disabilities to the MSG mission statement. I teamed up with the founders of Project EASI when it began in 1989 as a special interest group of the EDUCOM conference and professional organization of postsecondary IT leaders. Daniel Hilton-Chalfen became chair in 1990; we recruited Norm Coombs to be the next chair of EASI, and the rest is history. Meanwhile, Dan Comden joined the UW team as access technology manager for the UW and technology specialist when I founded the Disabilities, Opportunities, Internetworking and Technology (DO-IT) Center with National Science Foundation funding in 1992. At the time, the Internet was emerging; we used email, telnet, and file transfer protocol. Content was limited and mostly text-based and therefore accessible to students who were blind using early screen-reader technology. A moment comes to mind when Randy, a high school student at the time and one of our first DO-IT Scholars, described his first experience reading a newspaper independently because of its availability on the Internet. Randy is blind. Our UW team also networked with AT leaders at the Closing the Gap conference on technology for people with disabilities and the California State University, Northridge (CSUN) International Technology and Persons with Disabilities Conference. Later, Terrill Thompson, co-editor of this ITD issue, joined our UW team. In the early days, when we talked about accessible web design there were no standards or guidelines to point to so we made them up as we went. We often called the effort, borrowing from terminology in the field of architecture, simply the universal design (UD) of websites. In those early years, I would not have imagined that in 20 years there would be standards and guidelines for the accessible design of websites, that the technology used to present websites would be so complex, the range of devices used to access the web would be so diverse, and that UD would be broadly promoted as an approach for the design of a wide range of technologies as well as instruction and student services. I’m excited to be part of what comes next! My journey in the technology accessibility field began in 1994, as coordinator of the Computer Learning Center at Independence, Inc., the independent living center in Lawrence, Kansas. There we provided computer and assistive technology (AT) training to individuals with disabilities. Some of these individuals joined us in the challenge of keeping the lab up and running, dealing with conflicts that invariably emerged as assistive devices collided over interrupt requests (IRQs), direct memory access (DMAs), or input/output (I/O) addresses. Together we puzzled over how to install AT software applications in ways that would reduce the possibility of their stumbling over each other. These were fun times! The technology itself was grass roots, built by small companies or individuals, many of whom had disabilities themselves. Our screen reader of choice was Provox, created by Chuck Hallenbeck, a blind professor at the University of Kansas and advisor to our center. Provox was built for DOS, and we were honored to be using a beta release that exclaimed “Holy @!# Batman, here comes Windows!” whenever the user would launch Windows from the DOS prompt. This single exclamation summed up widespread feelings in the accessibility community at the time: computer users with disabilities were faced with a daunting change in technology and keeping up would require extraordinary effort. This feeling would be repeated in subsequent years, with the rise of the Internet, the explosion of online (and uncaptioned) video, and even today with the web emerging as a primary channel for hosting highly interactive cloud-based software applications. History repeats itself: innovation happens that breaks existing accessibility models and individuals with disabilities are shut out. The accessibility community works hard to develop new creative strategies for making the new technology accessible. Then just as accessibility has started to catch up, innovation happens again and the cycle repeats. Fortunately, we now understand this pattern, which I believe is the first step to changing it. During that troubled transition to Windows, some of our most dedicated patrons at the Computer Learning Center were students from area colleges and universities. Working with these students and helping them to self-advocate for better accessibility led me to an active interest in improving accessibility in higher education. Boulder, Colorado was a day’s drive from Lawrence, and I discovered kindred spirits at Accessing Higher Ground (AHG), the accessible technology conference organized by Howard Kramer at the University of Colorado. Back then AHG was primarily a regional conference attended by people from the Rocky Mountain states, plus at least one person from Kansas. The conference was well attended by people from higher education who were working to implement accessibility solutions on their campuses. Once I found my way into higher education, first at North Carolina State University and now at the University of Washington, I acquired a new respect for the vast breadth of the accessibility problem. We faced inaccessible websites; inaccessible documents; inaccessible software with very few accessible alternatives available on the market; and inaccessible textbooks and other print resources that required extraordinary effort to convert into accessible formats, with little or no help from publishers. These problems still exist today, but there are many signs that the state of accessibility is improving. This is the result of tireless work on the part of hundreds of people, including individuals with disabilities, accessibility advocates and evangelists, standards organizations, and many others who have elected to devote their time and energy to breaking down barriers and working hard for equal access. In 2002 at CSUN’s Annual International Technology and Persons with Disabilities Conference, I and a few dozen other people met in what would be the first annual meeting of a new association that adopted the name ATHEN, for Access Technology Higher Education Network. ATHEN is a network of higher education professionals committed to improving accessibility for students, faculty, staff, and administrators. Its purpose is to collect and disseminate best practices in access technology in the higher education environment as well as present a collective voice for the professional practice of access technology in higher education. One of the channels through which it has realized this purpose is its online publication, the ATHEN e-Journal. Four issues of the journal were published between 2005 and 2009, after which ATHEN and EASI began their collaboration on a combined e-journal, keeping the name from the original EASI publication, ITD Journal. The first issue from this collaboration was published in April 2013. The second is the current issue, which commemorates the ITD Journal’s 20th anniversary. The people who contributed to this 20th anniversary issue are among those who have worked tirelessly over the years to break down barriers for people with disabilities. Steve Noble was one of the original contributing editors of the ITD Journal since its beginning, and was editor of several issues after Tom McNulty's tenure, including the 10th anniversary issue. Therefore, it is fitting to feature Steve in the opening article of the current issue. In his article, Steve reflects briefly on the past, then gazes into the future and describes four things he expects to see in 2024 if enough accessibility advocates work together toward a few key goals. Daniel Hilton-Chalfen looks back to the first issue of the ITD Journal in 1994, leads us through key milestones over the last 20 years, and predicts the future in the field, particularly as it relates to accessible text. John Gardner shares the history, current state, and the future of making graphic images accessible to those who cannot see them. Sharron Rush acknowledges the contributions of our colleague John Slatin until his death from Leukemia in 2008, and repeats his words, “Good design is accessible design.” She talks about the value of competitive activities like the Accessibility Internet Relay for Austin (AIR-Austin) in stimulating awareness, excitement, and development of accessible websites. Cyndi Rowland also focuses on web accessibility, sharing developments that have occurred during her 15 years in the field and organizing her impressions around the issues of awareness; complexity; guidelines, standards, and laws; harmonization; and supports. She then discusses challenges that remain. Harry Murphy and Howard Kramer describe the roles of conferences—the CSUN Conference and Accessing Higher Ground, respectively—as agents of change and facilitators of networking that lead to new connections such as ATHEN. Sean Keegan talks about the history, importance of, and goal for “transparency” in accessible technology design. Finally, Darren Gabbert shares his experiences through milestones in the evolution of speech recognition technology. Enjoy your journey through the history of IT through the lens of accessibility over the past 20 years. Consider the challenges, frustrations, solutions, and partial solutions of others and compare your views to the predictions for the future through the eyes of leaders in this historical movement. Thompson, T., Burgstahler, S. (2014). From the Editors of the ITD Twentieth Anniversary Issue. Information Technology and Disabilities E-Journal, 14(1).